Daily Beast reports: “39-year-old Manhattan hedge fund manager and former altar boy named Anthony Chiasson was slapped with a six-and-a-half year prison term and a $5 million fine for crimes connected to insider trading. … There’s no excuse for Chiasson’s unethical behavior at Level Global. But it’s not hard, it turns out, to imagine why he did it; and why he might have thought he’d get away with it.” D1 As reported in Issue 1, UBS General Counsel (chief lawyer) David Aufhauser continues to get away with no insider trading prosecution do to his Obama UBS Attorney General Eric Holder granted UBS immunity. Aufhauser got a slight fine, no jail time, kept his law license and showed up as new lawyer at prestigious Washington law firm Williams & Connolly. Again specifically regarding UBS, USA Justice Department Assistant Attorney General Breuer is on record saying: “Our goal here is not to destroy a major financial institution.” Again specifically regarding UBS, USA Justice Department Attorney General Holder is on record saying: “‘I don’t want to indict people”. Crime pays at UBS under President Obama. Siebert Inc turned over to Client Mallard, UBS and USA Federal IRS true and correct USA Federally mandatory reversing journal entries or negative number zeroing out of the USA Federal UBS compliance documents to USA Federal IRS or Complainant. Siebert Inc has always properly complied with these mandatory US Federal IRS Mallard submissions. 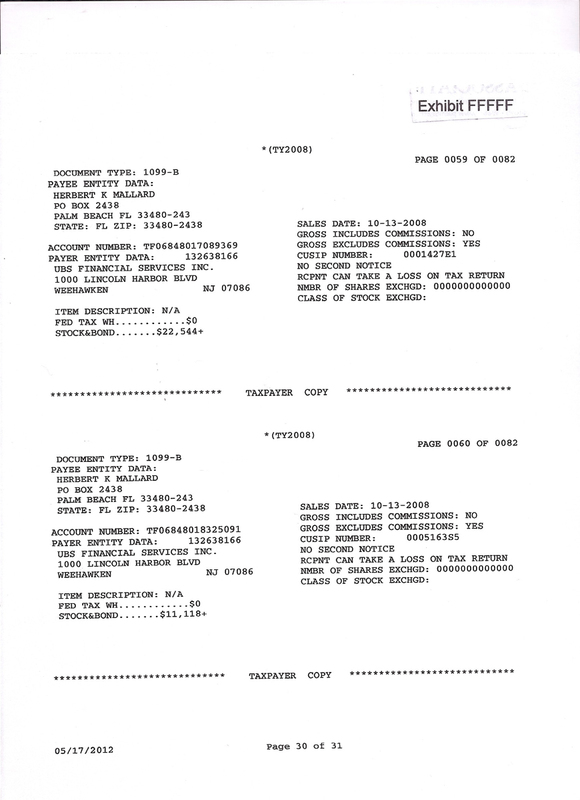 Mallard Siebert stocks transferred to UBS have never been properly documented under mandatory USA Federal law by UBS. 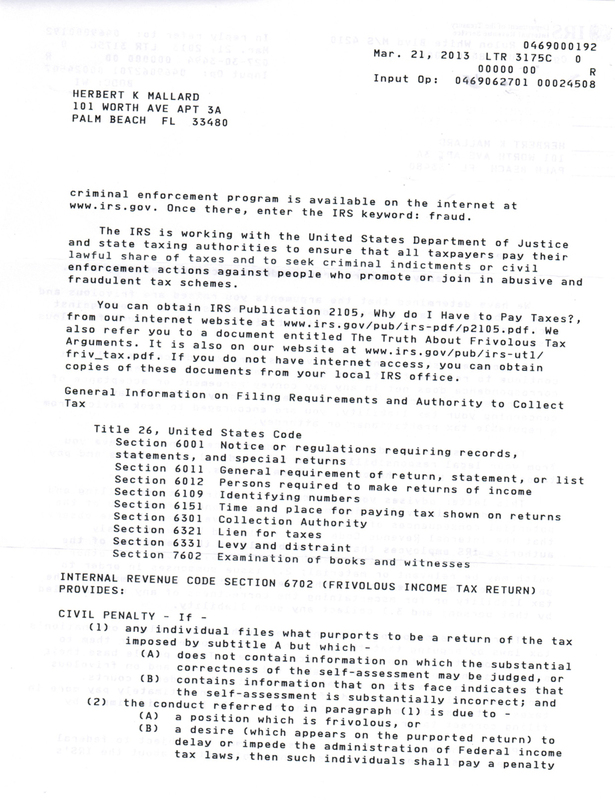 USA Federal IRS has questionably given UBS Client Mallard US Federally mandatory UBS faulty compliance submission documents as true and correct. UBS has always given incomplete UBS Client Mallard stock accounting to USA Federal IRS by saying the stock names are N/A or not available. UBS cannot comply with US Federal law without incriminating itself on the disappearance of UBS Client Mallard’s substantial assets. UBS Client Mallard refuses to sign any USA Federal IRS document saying UBS has submitted true and correct USA Federal IRS information. Such an act would make UBS Client Mallard complicit without the Obama UBS immunity. UBS Client Mallard has had HR Block Preferred power of attorney over his USA Federal tax compliance before the UBS targeting, solicitation, recruitment, harvesting and processing procedure. The USA Federal IRS Utah office has mentioned to UBS Client Mallard that even though UBS will not divulge the whereabouts of UBS Client Mallard assets, UBS Client Mallard still owes a USA Federal IRS tax on them. Let us recall in prior issues that the elderly UBS Client Mallard substantial primarily gold stock accounts entrusted to UBS were last seen being unilaterally converted into US dollars. 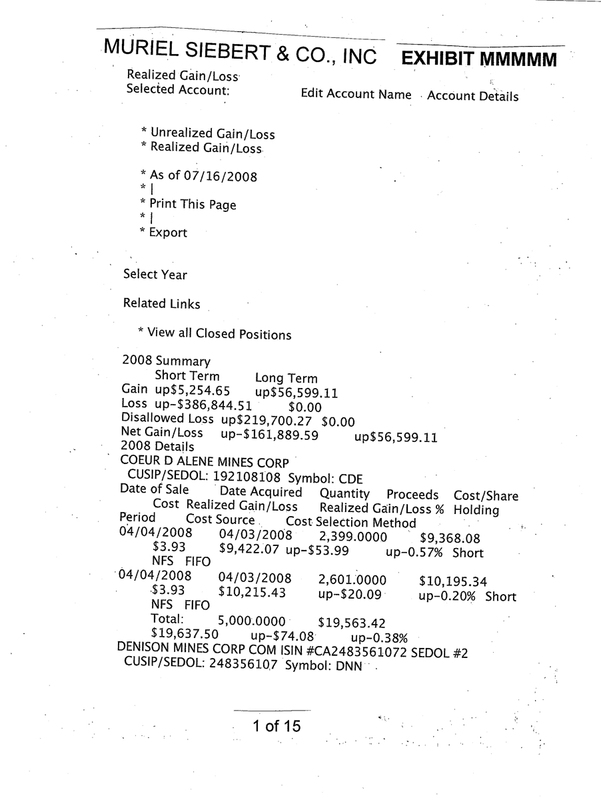 Displayed UBS documents clearly show these UBS Client Mallard primarily gold stock accounts were converted by UBS to US dollars. The UBS Client assets were then unilaterally off shore wire transferred to Switzerland or shifted between UBS affiliates without the knowledge of USA Federal mandatory written consent of UBS Client. 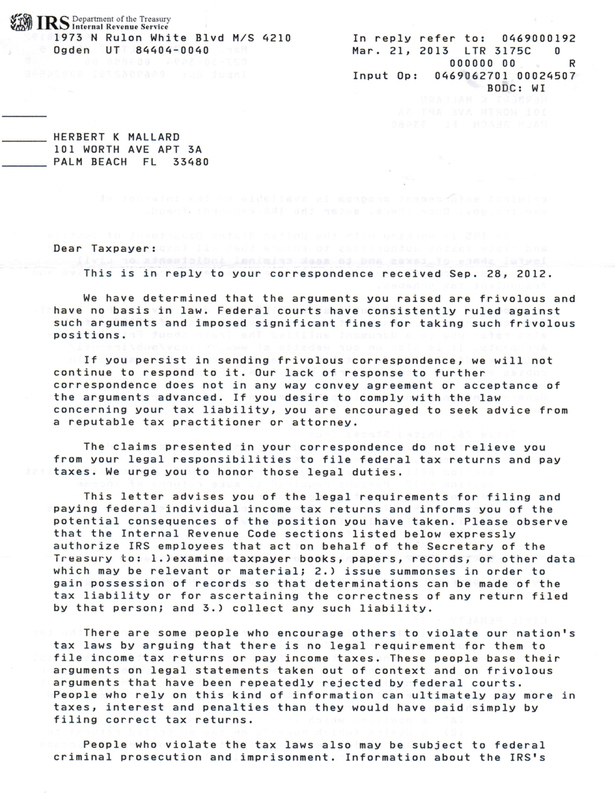 Again, UBS did not give US Federal IRS mandatory notification of the offshore wire transfers over $10,000. The USA Federal IRS Utah office started threatening elderly UBS Client Mallard with frighteningly vitriolic letters soon after media exposure. The above example speaks for itself. In conjunction with the USA Federal IRS Utah office threats, UBS Client Mallard has had his US Federally mandatory UBS account maintenance closed. UBS Client Mallard routinely frequents his UBS accounts. Honorable UBS AG (Switzerland) Chairman Kaspar Villiger’s office ordered a reopening of elderly UBS Client Mallard’s accounts to abide by the US Federal law. UBS AG Group Executive Board sees no need to abide by US Federal. They are correct as long as they continue Washington pay to play. Investment News reports: “After the market for auction-rate securities froze this year, many wealthy UBS clients who own the securities were angered to learn that the paper they were holding wasn’t, in fact, the equivalent of cash. In March, UBS was hit with a class-action alleging that it had deceived investors by selling the securities as highly liquid and a “suitable alternatives to money market funds.” D2 It seems UBS has been peddling securities under false pretenses and now has to answer to legal discovery of client victims. Independent Bangladesh reports: “Massachusetts regulators said the Swiss bank (UBS) had also agreed to pay civil fines totaling 150 million dollars as part of a pact with state authorities. … UBS would be the first bank to make all its clients “whole.” The bank has denied any wrongdoing. At the heart of regulators’ probes is the question of how the banks marketed the securities to investors. Some investors have claimed that the banks misrepresented how quickly the securities could be redeemed if an investor decided to cash them in. US banks and UBS marketed billions of dollars’ worth of the complex securities in recent years … They provided a rich business for many banks prior to the market’s collapse in February which left panicked investors scrambling to redeem their holdings and nursing paper losses.” D3 UBS senior staff seem to be in denial of their dubious behavior. They are continuing a pattern some think is criminal in nature, especially USA Federal prosecutors in Miami and Brazil. MULTIMILLIONAIRE THROWS HIMSELF IN FRONT OF A TRAIN AFTER UBS STOCK INVESTMENT! BBCNews reports: “A wealthy financier killed himself because he was worried about losing money … chief operating officer of private equity firm Olivant … had bought a 2.5 per cent share of Swiss banking giant UBS … Mrs Stephenson said her husband was facing significant financial loss. These were very real worries. These events made a substantial impact on him, and on his fearfulness for his financial welfare.” D4 We expect to see more suicides of UBS clients, investors and employees as the world economy gets more volatile. Unfortunately, it will most probably be the UBS victims rather than the UBS perpetrators that will be killing themselves. Investment News reports UBS CEO says: “Dealing with the auction-rate securities situation has been ‘very difficult’ for both clients and UBS advisers … Missteps with the funds and securities have put the most valuable — and vulnerable — UBS’ assets at risk: their reputations.” D5 UBS CEO continues to use light and fluffy words like difficult and misstep to explain alleged criminal behavior as well as its ramifications. Reuters reports UBS CEO says: “There is an aging issue. In the United States people add on financial service providers and then when they reach their late 50s they consolidate … We are investing to create perfection of the client’s experience … that this segment of the affluent population was estimated to have up to 20 percent of global wealth. … UBS was particularly interested in going after so-called ultra-high net worth individuals — those with millions of dollars to invest, whose wealth is growing faster than other segments.” D6 It is truly astounding that UBS CEO is talking in esoteric terms while investors and clients start committing suicide do to UBS rot at the top. Reuters reports: “Swiss parliament rejected a bill designed to resolve a dispute over undeclared bank accounts held by U.S. citizens, potentially setting the stage for American prosecution of the country’s banks. … Switzerland wants to prevent the indictment of another of the country’s banks. Wegelin & Co. was indicted last year and pleaded guilty in January to helping U.S. taxpayers hide assets from the Internal Revenue Service. The bank had taken over clients from UBS AG (UBSN), which avoided prosecution in 2009 by admitting it aided tax evasion.” D7 UBS bundler Chairman Robert Wolf is out while Chairman Robert McCann is in. 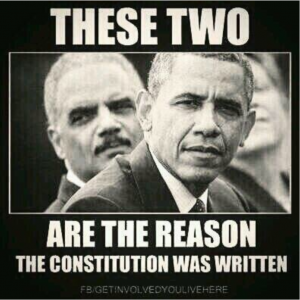 USA Federal IRS Director is out while USA Attorney General Eric Holder is still there. UBS Chairman Axel Weber recently successfully begged USA Congress for another UBS chance to keep it’s USA Charter. We have seen herein how an elderly Florida citizen was immediately attacked by the USA Federal IRS Utah Office soon after the Florida senior citizen’s interview was published in USA media. UBS continues USA Federal criminal violations with the assisting blind eye and deaf ear of US Attorney General Eric Holder. Holder is the glue that holds the continuing Obama/UBS scheme in place. We are seeing the classic bigger lie theory. I am a broker with a competing firm to UBS. My colleagues and I have known for some time about predatory practices of UBS but we have not been able to substantiate it for our Customers for fear they would consider us name callers. We now only have to point them to your site. We will spread the word and give you more info on UBS. We will drive them back to their numbered accounts in Switzerland. David Aufhauser and other UBS hierarchs had allegedly been insider trading for years with a DOJ and IRS deaf ear and blind eye. At first we thought it was some sort of US sting operation like Fast and Furious. You have allowed us to see it was a criminal scheme. David and all of the others have never been correctly prosecuted for insider trading for all of the Wolf/Obama years. Attorney General Eric Holder still allows this behavior. Do these UBS guys really know that much to make them above the law? Is this why UBS Chairman Raoul Weil was allowed to escape from USA Justice? In conjunction with the US Federal IRS Utah office threats, UBS Client Mallard has had his US Federally mandatory account maintenance closed under the direction UBS AG Chairman Axel Weber’s office, even though UBS Client Mallard routinely active. This gives Axel’s office plausibility of denial for UBS AG US Federal IRS compliance, unless UBS Client Mallard’s mandatory account maintenance is restored. Axel’s predecessor Honorable UBS AG (Switzerland) Chairman Kaspar Villiger’s office had ordered a reopening of elderly UBS Client Mallard’s account maintenance to abide by the US Federal law. Through our International contacts, we have not found another World advanced country where UBS has been able to purchase immunity from national prosecution as has been occurring under the United States Obama Administration. We expect a nuisance lawsuit from UBS but this will just further exacerbate UBS problems. Media, competitors, journalist organizations, First Amendment guardians as well as internet activists are awaiting a UBS attack. UBS will not be able to stand light of day transparency within a legitimate court of law. We have a fiduciary relationship with UBS employees and other reliable sources. We await a UBS whose hierarchy that would make yet another dumb decision and routinely blame another “act of God”. A prominent Swiss official was recently an impromptu guest of Mallard’s in his Palm Beach, Florida condominium. They have a Palm Beach friend in common who made the introduction. The Swiss official said UBS AG Switzerland and the Swiss Government do not like the expanding exposure of the Mallard UBS AG conflict. They further do not like that embassyofswitzerland.com is exclusively reporting the ramifications. UBS Client Mallard could only comment on UBS AG reluctance to mandatorily comply with the United States Internal Revenue Service. UBS General Counsel David Aufhauser’s office and Associate Counsel Craig Darvin personally (Issue 1) are on record as not allowing UBS Client Mallard’s proper compliance documentation to be divulged to the United States Internal Revenue Service. In the past, Honorable UBS AG Chairman Kaspar Villiger intervened on UBS Client Mallard’s behalf regarding the Federally undeclared unauthorized offshore wire transfers of UBS Client Mallard’s account assets. We now have Chairman Axel Weber’s office recently terminating UBS Client Mallard’s mandatory account maintenance and disregarding UBS IRS compliance. We do not know the results of the conversation between the Swiss official and Mallard for Mallard is respecting the confidentiality. The common friend and the Swiss gentleman continued to nearby Donald Trump’s Mar a Largo for dinner. UBS is afraid of Mallard’s persistence but is reluctant to relinquish his account assets for fear of opening the floodgates to US lawyers. The reason is that Mallard lives in Palm Beach and knows many UHNW (ultra high net worth) individuals. If UBS settled, Mallard would then presumably tell others. In essence, UBS is a captive of their own devious machinations. Conversely, if Mallard disclosed anything to others he would be in a more difficult predicament than UBS in that he would be inundated by others eagerly seeking UBS restitution. Mallard said he is in no position to divulge anything to anybody but for his lawyer and occasionally our publication. This similar scenario was played out in Palm Beach with Madoff and his victims. The Mallard UBS dispute is extremely popular with our readership. It would be in our interest to see the dispute disclosures continue in perpetuity. Let us watch to see what transpires since UBS cannot allow disclosure of their opaque support infrastructure to continue. Many within the UBS support group have already had their careers damaged by these on-going events. Stay tuned!